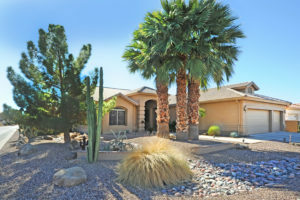 Oakwood Country Club Home for Sale - 9841 E. Emerald Dr.
You are here: Home / Chandler AZ Real Estate / Oakwood Country Club Home for Sale – 9841 E. Emerald Dr.
Oakwood Country Club Home for Sale – 9841 E. Emerald Dr.
9841 E. Emerald Drive in Sun Lakes, AZ is now available! 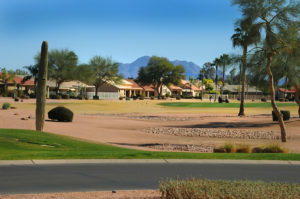 Check out this Oakwood Country Club listing in Sun Lakes, Arizona sold by the original owner. You’ll love the golf course and mountain views from the family room, kitchen and patio in this expanded Marbella floor plan home. And you won’t need to worry about golf balls in your yard! You’ll love the four extra feet added to the center of this home which extends the bedroom, laundry and family room. Plus, there is a HUGE walk-in pantry and utility closet for extra storage space. And there is a two-foot bump out added to the dining area and family room, too. In addition, the seller divided the formal living and dining room to create a spacious den/office. And you’ll really enjoy spending time in the kitchen. It was reconfigured with the sink on the east wall with two picturesque windows… so you can look at the great views while cooking or entertaining! There are also staggered cabinets and a huge island with granite. The extra space continues in the master suite. If you have a lot of clothes, shoes and accessories, plenty of storage space awaits with two walk-in closets and an added enclosed closet. In addition, the master bath had the tub removed and cabinets added so there is additional counter space. Your guests will enjoy their own space, too! The guest bedroom fits a king bed and the third bedroom is currently a hobby room. There are plantation shutters on all but the view windows with a security front door. And you’ll also enjoy a three-car garage with storage cabinets. This home has soft water and an RO system. And additional AC vents in the living and family rooms provide more efficient air flow. Outside, you’ll find a full-length covered patio and added sitting space on the back patio with a built-in BBQ grill. In addition, this Oakwood Country Club home includes many resort amenities including: golf, tennis, pickle ball, a heated pool and spa, a workout facility, restaurants, a bar, a Rec Room and Club House with concerts and entertainment, lakes, biking/walking paths, an onsite guard, Concierge, and more! This is your chance to live in a gated active adult community that is one minute from the Club House! To learn more about this home, click here. Don’t miss out on this spacious home in a great location. 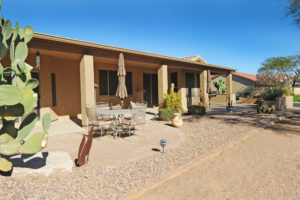 Contact us at (480) 440-0849 or here to schedule your walk-through now. Looks like a great home! Love the course and mountain views without the golf balls in the yard. The no golf balls in the yard is a great feature! Thanks for the comment.